How much does it cost to travel to Johannesburg? How much money will you need in Johannesburg? R1,364 ($97) is the average daily price for traveling in Johannesburg. The average price of food for one day is R242 ($17). The average price of a hotel for a couple is R1,541 ($110). Additional pricing is in the table below. These average travel prices have been collected from other travelers to help you plan your own travel budget. How much money do I need for Johannesburg? Johannesburg is the largest city in South Africa with a population of over 3 million people. Most of the population is made up of South Africa's black residents, who predominately reside in the Soweto area. There are approximately half a million white residents and 300,000 residents of other descent. Half of the population live in the Soweto area as well as the nearby suburbs. Johannesburg is at the economic center of the country, but there is a very extreme and obvious inequality of wealth distribution. While some of the population lives a first world quality of live, there remains a large portion of the population that lives a third world quality of life. This disparity has caused the city to have one of the world's highest crime rates, a fact that intimidates many travelers. Don't be disillusioned by this fact though, because it is very possible to travel safely and confidently in Johannesburg if you make wise decisions and take the necessary precautions. Johannesburg's climate is subtropical highland. The summer months, between October and April, have hot days and cool evenings with frequent afternoon thunderstorms. The winter months, between May and September are dry with sunny days and cold nights, with temperatures dropping below 40 degrees Fahrenheit at night. Snow is extremely rare, although freezing temperatures may occasionally occur. There are plenty of interesting attractions and sights in Johannesburg. The city's Central Business Disstrict was heavily revitalized leading up to the 2010 World Cup. Of particular interest are the Newtown and Market Theatre areas. This is the city's cultural district and has many music venues and a decent nightlife. Also make sure you visit the Top of Africa, which is Africa's tallest building, and check out some of the museums and art galleries in the area such as the Johannesburg Art Gallery, the Standard Bank Gallery, and the Sci-Bono Discovery Centre. In the city's northern suburbs you'll find the Johannesburg Planetarium, the South African National Museum of Military History, the James Hall museum of Transport, and Cherie De Villiers Gallery. Many visitors head to the Soweto area as well. Popular sights in the area include the Mandela Family Museum, the Apartheid Museum, and the Absa Money Musuem. Notable neighborhoods in Johannesburg include Soweto, Newtown (downtown), Sandton, Rosebank, Parkhurst, Melville, Alexandra, Braamfontein, and Fourways. Soweto is the largest and most famous black township and the home of Nelson Mandela and Desmond Tutu. Newtown has been revitalized and has a lot to offer visitors looking for culture and music. 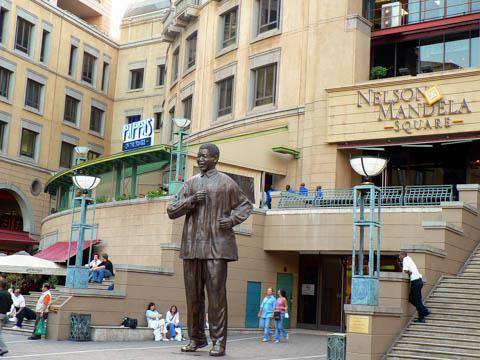 Sandton is located in the northern suburbs and is a business and entertainment hub. Rosebank, also in the northern suburbs, has many shopping and entertainment areas. Parkhurst is often compared to Soho or Greenwich Village. Melville is a nice area to walk around with restaurants, bars, and tree lined streets. Alexandra is a historic area with a variety of tours available. Braamfontein is the university area and Fourways has many shopping and entertainment areas. There are some interesting tours that you can arrange in Johannesburg. Township Tours to Soweto will guide you through the Soweto region. Make sure you only use official tour operators. Sophiatown Heritage Tours are informative and fascinating as well. Walking tours begin at the original 1930s house of Dr AB Xuma. Other areas of interest include the Walter Sisulu Botanical Gardens, Constitution Hill, Lesedi Cultural Village, Lion Park, Suikerbosrand Nature Reserve, and Gold Reef City. As a large, international city, you can expect to find almost any type of food in Johannesburg at any range of budget. There are some specific streets that have a high concentration of great restaurants worth checking out. 4th Avenue in Parkhurst is an upmarket area with a lot of cafes and restaurants. Illovo Junction also has a growing number of restaurants. 7th Street, in Melville, has a variety of restaurants that appeal to the student population. Gleneagles Road in Greenside is also a great option on weekends when the music scene is thriving. Grant Avenue in Norwood has some simple restaurants that offer pizza, Italian, or sushi. For good Indian food head to Fordburg and Cyrildene has the best Chinese restaurants. In the central business district you'll find the best restaurants around the Market Theatre in New Town. Public transportation is not ideal in Johannesburg, as the city was designed specifically for vehicular travel. To make your way from the airport, the Gautrain is the best option. If you're traveling within the city, you can find buses and minicabs, but the system can feel informal and chaotic with no real designated stops. Instead you'll have to flag the buses down yourself. The safer bus option is to use the double decker metro buses that are more organized and easier to understand. Many people choose to rent a car while they're in town. Make sure you have an excellent map and a good GPS system as it is easy to get lost. Taxis are also available at the airport and in some areas of Sandton and the city center. You should only use the normal sedan taxis which have meters and fixed prices. Make sure you are quoted a fair price in advance and negotiate if the price seems unreasonable.